the stress inherent in that deformation. Most studies investigate each of these topics separately out of the need to isolate and focus on essential relationships. 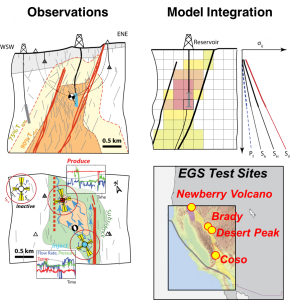 My work attempts to integrate these different topics by modeling ancient geologic systems exposed at the surface or by direct observation of active systems at depth using boreholes. How the Earth works: The crust of the Earth is filled with fractures and these weaknesses govern its strength, its response to tectonic stresses/strains, and its hydrologic properties. Water and contamination: These same fractures determine our access to fresh water and the spread of contaminants in aquifers. Informed Citizens: In an ever shrinking world, with growing population and ever greater demand on resources straining our environment, our votes have perhaps the greatest impact ever on sustaining our civilization.